With first nights selling out literally within minutes, Paul McCartney’s One On One tour has confirmed additional shows in Chicago, Newark NJ, New York City, Brooklyn, Uniondale NY and Detroit. Additionally, McCartney will return to Oklahoma City for the first time since 2002 to play the Chesapeake Energy Center on July 17th. One On One’s 2017 U.S. run kicks off July 5th at Miami’s American Airlines Arena—his first Miami appearance since his Up & Coming Tour hit Sun Life Stadium in 2010— and includes cities and venues he’s never played before. 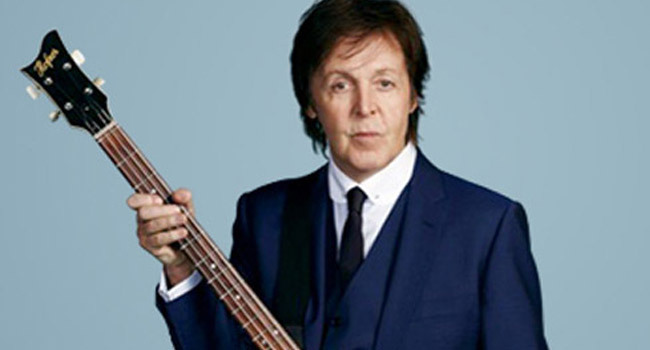 From Miami, McCartney heads to Tampa where he will play July 10th at the Amalie Arena, returning to the city for the first time since his 2005 US Tour. From there, One On One takes McCartney to three cities and venues he’s never played before: July 13th at the Infinity Energy Arena in Duluth GA, July 15th at CenturyLink Center in Bossier City LA, and July 19th at the INTRUST Bank Arena in Wichita KS. On July 21st McCartney plays the Wells Fargo Arena in Des Moines, IA followed by a July 23rd stop at CenturyLink Center in Omaha NE, returning to both cities for the first time since 2005’s US Tour. The tour’s July run concludes on the 25th at the Hollywood Casino Amphitheatre, Tinley Park in Tinley Park, IL — McCartney’s first appearance in the region since his now-legendary 2015 Lollapalooza headline. One On One’s 2017 U.S. run will resume with McCartney’s first ever show at the Prudential Center in Newark, NJ on September 11th. McCartney will then take up residence in New York City, playing his first full show at Madison Square Garden since 2005 on September 15th, then getting back to the scene of his unforgettable 2013 Brooklyn shows to play the Barclays Center on September 19th. He will then head upstate to make his debut appearance in Syracuse NY, playing the Carrier Dome on September 23rd, followed on September 26th by his first show at Long Island’s NYCB Live’s Nassau Veterans Memorial Coliseum since 2002’s Driving USA Tour. One On One’s fall dates will draw to a close October 1st at Detroit’s Little Caesars Arena, McCartney’s first show at the brand new venue and first visit to the Motor City since 2015. The newly added dates in New Jersey, New York, Brooklyn and Uniondale all go on sale to the public on May 12th at 9 am. Tinley Park goes on sale to the public May 12th at 10 am. The new Detroit show will be on sale to the public May 13th at 10 am. Oklahoma City goes on sale to the public May 15th at 10 am. All times local to venue.